thoughts about life from beyond the grave: NAUGHTY ANTICS AT THE BBC! I am back to my late husband again and would like to share an amusing tale with you , to show that even though his poetry is quite serious, the man himself was an extremely charasmatic and funny person. Back in the 60/70's Alex worked for BBC television at their White City studios in London - where they still operate from . He was a back-stage technician and worked many of the shows, and had a lot of fun. Because of the nature of his job he worked long hours, with often nothing to do in between shoots. He loved clowning around and one day he decided, along with one of his mates, to ask the make-up girls (who also had long periods with nothing to do) to make them up as women. The girls agreed and ' went the whole hog' with not only the make-up but the hair-do as well! The result on Alex was so good that he really did look like a woman and the girls took a head and shoulder photo of him. 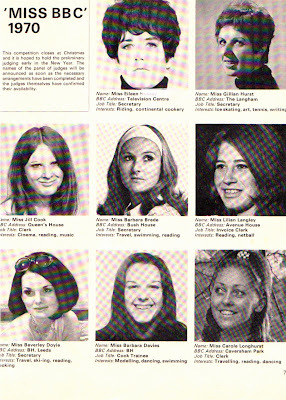 At that particular time the ' Ariel' magazine which was the BBC's staff magazine was running the annual " Miss BBC Competition"! I bet you can guess what I am about to write --YES Alex sent his photo up with a psuedenym -- and then forgot about it. It is the top left hand picture. That night he came home and showed me the picture, saying that it was a girl who had just joined their team. I thought she was quite good looking and was feeling a bit jealous that he had bothered to take a picture of her, when he told me it was himself! I HADN'T EVEN RECOGNISED MY OWN HUSBAND? I too thought it was a hoot that he had entered it into the BBC contest. The outcome actually was almost disastrous. They picked the finalists by photo selection only and I might add here that there were more entrants than those I have shown above. Alex ( can you believe) was chosen as one of the finalists, which meant that he had to go before a panel in a swimsuit parade ( haha). Of course it was at this moment that he decided to ' come clean' and confess that he was really a guy! And a normal one - with four children. There was a huge fuss and he was almost offered the door! Thank goodness they didn't. The daily Mirror gave Alex a two page coverage with photos titled ' Father of four in the Miss BBC contest final"! Ah well! That was my man! Well it was the 60's lots of silly things went on! Shame he did't go as far as the swimming costume bit...that really would have been a hoot!! This is hilarious!!! He was a great sport and full of fun... what a crazy fuss this must have made.. great conversation piece!!! Thankyou to Gwen and Akim for taking time to drop by. I have giggled about this over the years, so glad I kept the magazine, but lost the newspaper clipping in my last move. ahahahaha, this is too funny. Really enjoyed it! Quite a looker, eh?